There's a subtle shift in this weekend's new releases, with a lot more limited and prestige-type runs entering the market, along with some films that pass for what we'd call an early fall blockbuster. Oscar is on his way, and helping to boot us out of one of the worst Septembers in recent memory. 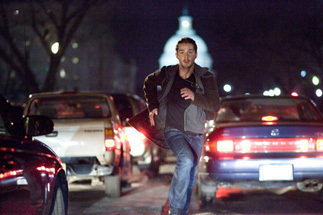 First up is the techno-thriller Eagle Eye, starring Shia LaBeouf, voted most punchable celebrity of 2008, and Michelle "I'm not married to Tom Cruise" Monaghan as two strangers thrown together by a mysterious conspiracy and forced to commit a series of crazy crimes, with the conspirators always seemingly one step ahead of them. Meanwhile, two federal agents (Billy Bob Thornton and Rosario Dawson) chasing them down start to suspect these sudden terrorists might not be all they appear. The premise for Eagle Eye is quietly brilliant, like something Hitchcock might have come up with, which makes sense considering director DJ Caruso aped him last year with Disturbia (and calm down, cineastes, I am not comparing DJ Caruso to Alfred Hitchcock). The idea of being manipulated by an omniscient conspiracy is a rich one in film, and the ads use it to a wonderfully creepy effect. Add in some big explosions and destroyed buildings, and in Hollywood mash-up speak, it's The Game meets Enemy of the State.